As of 2016, a shocking 564,708 people were experiencing homelessness in the United States. This statistic includes those sleeping either outside, in transitional housing programs, or in emergency shelters. But placing homeless individuals in these vacant homes is unfortunately not so straightforward. Issues of logistics and legislative red tape typically means the best cities can do is hope that private companies are responsible with properties they have acquired from banks. Beyond concerns of policy, an estimated 15% of the homeless population are considered “chronically homeless”, meaning an individual who has either experienced homelessness for more than a year, or an individual with a disability who has experienced four or more episodes of homelessness in the past 3 years. A majority of chronically homeless people have severe mental illnesses, substance use disorders, or disability as a result of physical illness, injury, or trauma. One large demographic that historically has not received as much attention, however, is that of homeless children and youth. That is why, when Lightwork learned of the huge homeless youth population in Atlanta, everyone involved with Lightwork felt moved to help. As a recent resident of Atlanta, Lightwork’s own Mele Thompson was the first to inform the organization of the homeless youth issue. As a 2015 Georgia state report found, children under the age of 18 comprise 18% of the homeless population, 13% of the homeless population are youth between the ages of 18 and 24, and a staggering 30% of the homeless population are families with children. To truly make progress in remedying the problem of homelessness in America requires more than merely ensuring there is a house for each individual. To make effective and lasting progress, our nation must ensure that each homeless person receives the adequate support they need in order to flourish in society and reduce the risk of chronic homelessness. 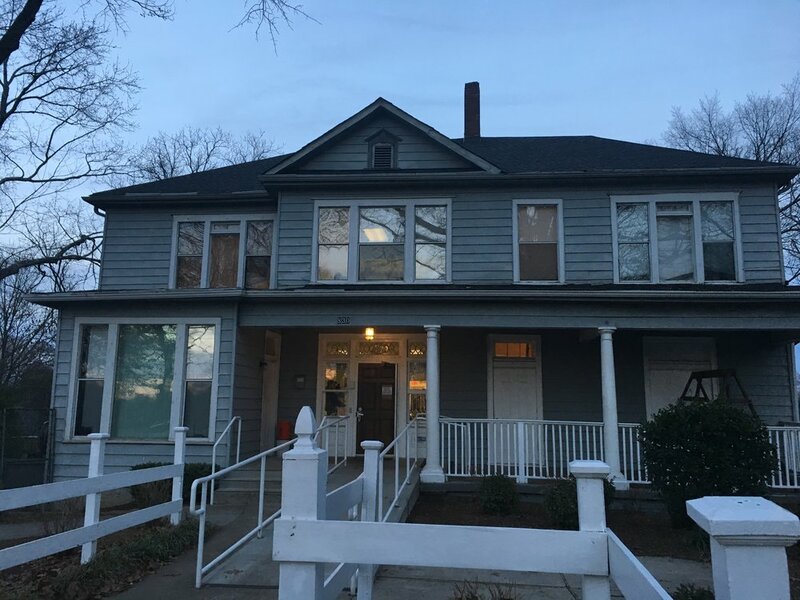 Enter the Nicholas House in Atlanta, Georgia: simply stated, the mission of Nicholas House is to help homeless families achieve self-sufficiency. In doing so, the families of Nicholas House work towards three main goals: to earn a living wage, to maintain the physical, mental and social health of parents and children, and to maintain safe and stable housing. The goals are straightforward and they work: 80% of families maintain their own housing a year or more after exiting Nicholas House. Mele and everyone at Lightwork felt moved to assist Nicholas House upon learning of their commitment to ensuring support for homeless families. 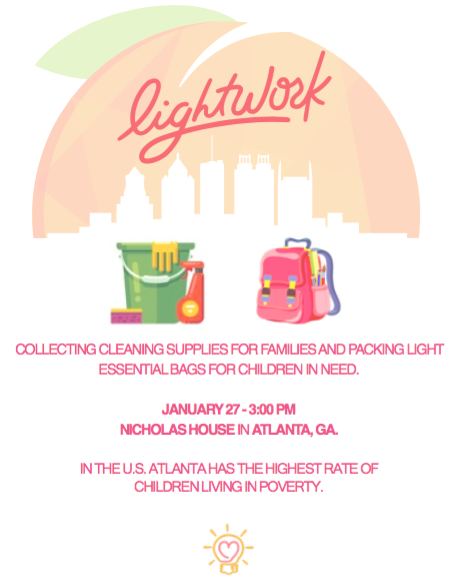 First, Lightwork contacted Nicholas House to inquire about what supplies they were in need of most: cleaning supplies and snacks. The idea was that, by assisting the organization with accounting for basic needs of these families for a while, Nicholas House would be freer to focus on the larger issues of equipping the families with the long-term skills necessary to improve their lives. Through a combination of online crowdfunding (amongst these, the largest donation was made by Solopani and Ofa Tulua in honor of their 25th wedding anniversary!) 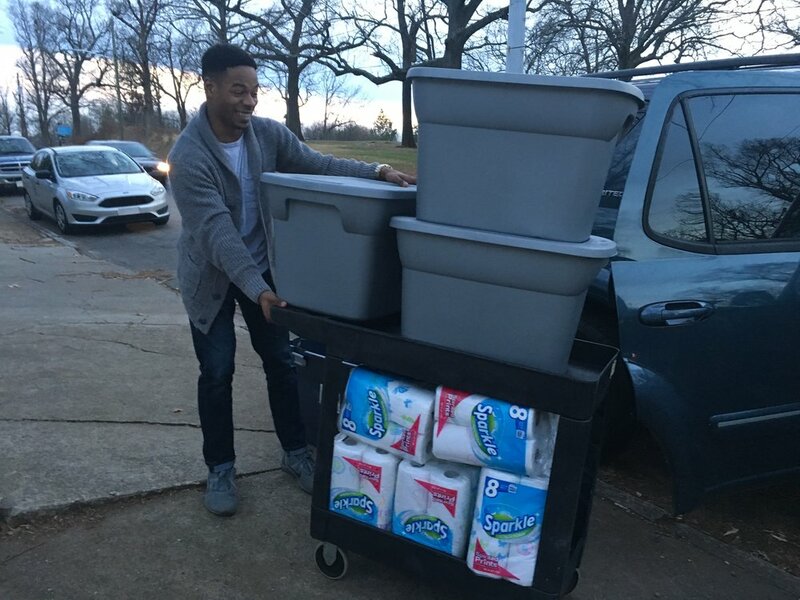 and physical outreach, Lightwork was able to personally deliver to Nicholas House a generous care package including disinfectant wipes, all-purpose cleaner, spray bottles, paper towels, large storage bins, and more. As a special way to motivate the youth Mele was able to package light snack bags complete with hand-written words of encouragement, thanks to the help of the D-trex Dance Ministry—which Mele and her husband Greg were a part of. Mele recalls the importance of these snack bags: “The intention of the snack bags was to give them something sweet to come home to, and be encouraged no matter what their circumstances look like.” As it so happens, many of the youth at Nicholas House were aspiring dancers, and were amazed that Mele and Greg were able to attend college and still foster their creative passion for dance. For Lightwork, being able to encourage those youth to follow their passions, regardless of societal expectations or pressures, was an extremely powerful moment. “At the end of the day, the children were happy with their little gifts and the workers of Nicholas House were so happy to receive their supplies just in the nick of time. Seeing their smiles and thankfulness was well worth all the stress and late nights”, recalls Mele. For all those involved, Lightwork Atlanta felt like a huge success, and another pivotal opportunity to remind those most in need that, everyone, deserves love and light. The Nicholas House first opened its doors in 1982, not a single shelter in Atlanta was capable of housing families for more than one night and none were offering services geared toward fostering self-sufficiency. Though every family is different, Nicholas House realizes it is only through addressing root causes of homeless that individuals can achieve self-sufficiency. Nicholas House ensures extended aftercare programs for all families—up to two years after exiting. Unlike other shelters, Nicholas House does not separate families. The services they offer are comprehensive, including both adult education/training (interview skills, resume writing, budget management, debt reduction, computer use, parenting skills, stress management, etc.) and youth programs (after-school programming, summer camp, evening activity hours, mentoring designed for age-specific groups, tutoring, building personal skills, etc.). Special thank you to Mele and Greg Thompson, D-Trex Dance Ministry, Solopani and Ofa Tulua, Jessica Sales, Chloe Mendoza and the Nicholas House.